Happily here is one more chance to see the most recent film by Agnès Varda. Now ninety years old Agnès Varda has graced the world of film since the days when the nouvelle vague transformed both French and European cinemas. Her style is often eclectic and she has a whimsical turn of cinematic phrase. But she always brings a real empathy to her subjects and her films are fascinating but at the same time complex essays into contemporary society. 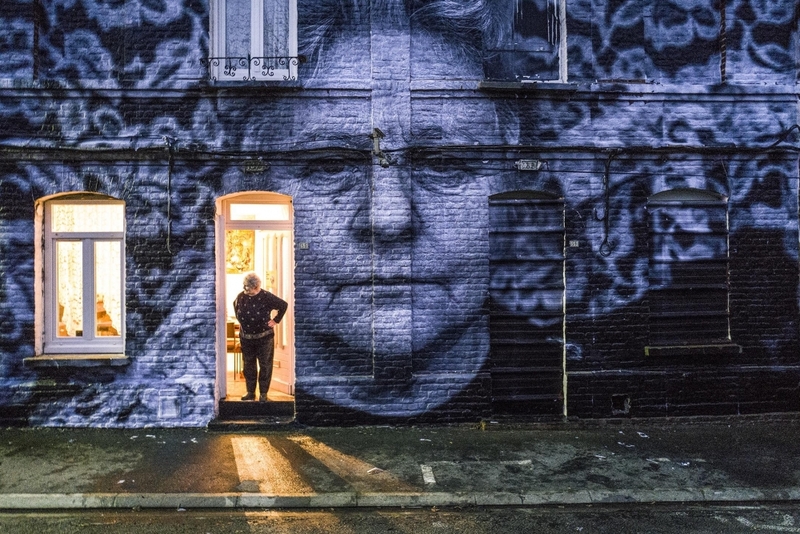 Her new film follows a journey and odyssey with a French photographer known as JR. His approach to the medium is eccentric and unique. Travelling round in a vehicle shaped like a camera he snaps people in places and produces seriously enlarged copies of the image. This is followed by pasting the pictures on public places, mainly walls of buildings. This practice sheds a whole light on the subject and on photography itself. In the course of their odyssey Agnes and JR discuss topics, revisit places and people and reminisce. Both are often playful but there is an underlying seriousness to their work. And the tone of their encounters and of their installations generates real charm. A number of titles from Varda’s work over the years have been screened in programme ‘Gleaning Truths: The Films of Agnès Varda‘. These have included features like her early and seminal Cleo from 5 to 7 / Cléo de 5 à 7 (1962) or her documentaries like The Beaches of Agnès (2008) Les plages d’Agnès (2008); films from either end of her long career. The latter film like this new title is less a documentary and more like a film essay; the forte of one of her peers Chris Marker. This friend and peer is referenced in the film by the ubiquitous cats; another peer, Jean-Luc Godard has a less happy reference. The film is in colour and with English sub-titles, running for 94 minutes.